Notice her delicate intensity, her strength of conviction — authentic rather than put-on-for-effect — her witty tenderness, her elastic yet perfectly respectful phrasing . . . Marianne is a model of joyously inventive improvisatory singing, her sweet candor transforming any song. Her belief in the lyrics, her immersion in the emotions of the song, her courageous yet friendly bending of the original melodic line — all of these virtues make her singing entrancing. You might not initially notice that the “new” verse, perfectly appropriate and deeply felt, is Marianne’s own composition — which points to another talent. This year, she created and produced her second CD, SPARK (Hipnotic Records) — compelling yet light on its feet. Here’s a video that will give you a taste of the disc’s riches. One of the songs is THE HUMDRUM BLUES, but nothing about this effort is in the least monotonous. Although I’ve heard Marianne favor dark, pensive songs, SPARK is lively and energized. She has power, but it’s never being wielded against an audience. SPARK starts off immediately at a high level — with the title song, which Marianne created, words and music. Unlike many singer-songwriters, she is not attempting to fit words and notes into a conventional box. Her songs sound much more like conversations with an audience — or the listeners — or someone being wooed. Her lyrics might use conventional phrases, but they are always arranged in new ways, without formal reliance on end-rhymes. The song SPARK depicts the heady beginning of a romance; FIRST DESIRE (Marianne’s setting for the Lorca poem) is a rumination, full of images and evocations, music and lyrics evoking exalted states. IF I WERE TO LOVE YOU is a paean to love’s magic in the natural world, although voiced in the subjunctive. ON A CLEAR NIGHT meditates on a love affair tenuously balanced between past happiness and present erosion. 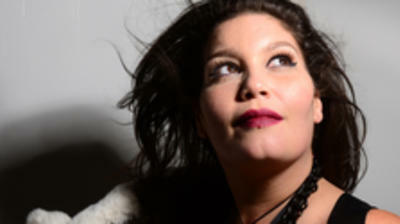 THE DOVE, a collaboration between Marianne and pianist Xavier Davis, seems a twisting, intense carpe diem — don’t neglect love! Marianne’s compositions do not reveal themselves immediately, but each re-examination offers new levels of emotion and intelligence. 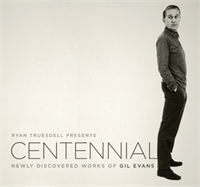 The other songs on this disc are wonderfully varied. There’s Oscar Brown, Jr.’s sharp-edged HUMDRUM BLUES (which has a touch of hope if one gets through the complaints of the lyrics); Francesca Blumenthal’s darkly ambivalent THE LIES OF HANDSOME MEN. Marianne also gives her own singular transformation to songs associated with others: the sardonic modern folk song TENDER AS A ROSE (Abbey Lincoln), which sits somewhere between an unwritten PORGY AND BESS song and FRANKIE AND JOHNNY; I WANNA BE AROUND (Tony Bennett) which has a violent swinging energy, suggesting that Marianne could be dangerous if crossed, although she’d never diminish her rhythmic energy in the midst of taking revenge; a very brisk THIS IS NEW, rescued from those singers who have turned it into a moony dirge in opposition to the exultant lyrics. Ruben Blades’ EL CANTANTE (THE SINGER) is beautifully sung in Spanish — truly evocative — and Marianne explains the lyrics in part in the video. Singing Loesser’s WHAT ARE YOU DOING NEW YEAR’S EVE? she rescues this song and brings a tender sweetness to the title — making the question vibrant yet fragile. OOH, WHAT’CHA DOIN’ TO ME, by Timmie Rogers, is a Forties trifle that offers Marianne the opportunity to play — she never copies Billie, early or late, but I think of WHAT A LITTLE MOONLIGHT CAN DO as the only parallel to Marianne’s evident delight. SPARK is buoyed by Marianne’s joy in the music, but also by the evident joy in the studio, as Marianne and her working band take pleasure in creating together. They are Xavier Davis, piano; Matthew Parrish, string bass; Gregory Hutchinson, drums. The instrumental settings are fresh: one never thinks of “singer plus rhythm trio,” but rather of four musicians on an equal footing. The CD is splendidly recorded by Joe Marciano and Max Ross, with excellent liner notes by drummer Lewis Nash. SPARK is never formulaic, but it is not oddly or whimsically “innovative” in offputting ways. Marianne’s inventiveness is refreshing throughout, but her music will not scare anyone off. She always sounds like herself, which is delightfully reassuring. I am happy to experience her blossoming creativity, and I look forward to more surprises. 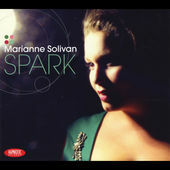 SPARK is available in all the old familiar places: CDBaby, Amazon, iTunes, but I suggest you begin your investigation here — you can learn more about Marianne, keep up with her schedule, perhaps take a class with her (she is a most respected and beloved teacher of singers), and more. Here and here are Facebook pages where you’ll find Marianne . . . but the best way to experience her magic is to buy her CDs and meet her at a gig. Whichever comes first or is more convenient is the one I recommend to you. Don’t wait until she is booked into huge concert halls and the security prevents your getting close to the stage . . . catch her now.